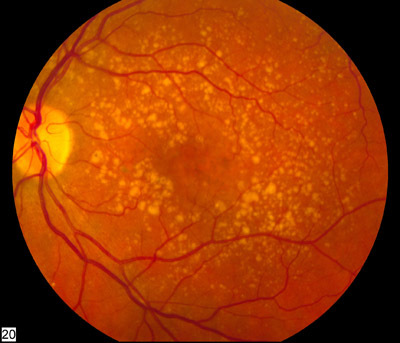 Macular degeneration, also known as age-related macular degeneration (AMD or ARMD), is a medical condition which may result in blurred or no vision in the center of the visual field. Early on there are often no symptoms. Over time, however, some people experience a gradual worsening of vision that may affect one or both eyes. While it does not result in complete blindness, loss of central vision can make it hard to recognize faces, drive, read, or perform other activities of daily life. Visual hallucinations may also occur but these are not serious and do not represent a mental illness. Macular degeneration typically occur in older people. Genetic factors and smoking also play a role. It is due to damage to the macula of the retina. Diagnosis is by a complete eye exam. The severity is divided into early, intermediate, and late types. The late type is additionally divided into "dry" and "wet" forms with the dry form making up 90% of cases. Prevention includes not smoking, exercising, and eating well. Vitamin supplements do not appear to be useful for prevention. There is no cure or treatment that returns vision already lost. In the wet form, anti-VEGF medication injected into the eye or less commonly laser coagulation or photodynamic therapy may slow worsening. Supplements in those who already have the disease may slow progression. In 2010 it affected 23.5 million people globally. In 2013 moderate to severe disease affected 13.4 million and it is the fourth most common cause of blindness after cataracts, preterm birth, and glaucoma. It most commonly occurs in people over the age of fifty and in the United States is the most common cause of vision loss in this age group. About 0.4% of people between 50 and 60 have the disease, while it occurs in 0.7% of people 60 to 70, 2.3% of those 70 to 80, and nearly 12% of people over 80 years old.